It was a joy this evening to commemorate these two Saints at our monthly healing Vespers. You abandoned the Egypt of the passions, O Father, Ascending the mount of the virtues with fervent faith, Taking the Cross of Christ upon your shoulders; And being glorified in godly works, You proved to be a model for monastics, O summit of the fathers. Pray unceasingly with them that our souls may find mercy! Your mind was filled with a holy inspiration from God, Turning you from the lust and pleasures of the flesh, Bringing you to the height of the city of God! 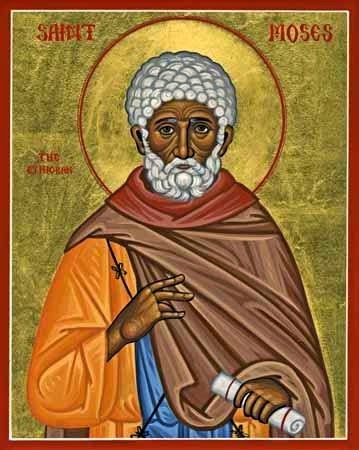 O Holy Father Moses, intercede with Christ God that He may grant us great mercy! 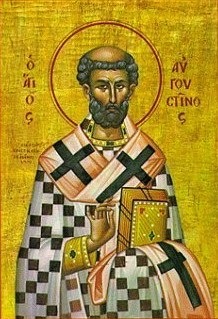 Let us acclaim the sublime Augustine, the holy bishop of the Church of Christ; The wise writer of the City of God; You are good, blessed Augustine and you served the Savior in sanctity as a wise and divinely inspired priest; Father pray to Christ our God to grant our souls the grace of salvation. We praise you with resounding voices O heavenly trumpet of wisdom; You are the harmonious organ of theology O most blessed father Augustine; You have given us rich knowledge of Christ's faith, and you have increased the flock of the Church; You now take rest with the angels and still pray unceasingly for all of us.